Welcome to the Davenport North Girls Golf Web Page. We are so thrilled that you are interested in being a part of such a special sport. 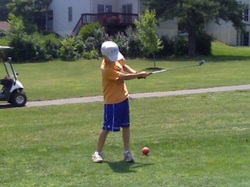 By reading the information that follows you will be able to prepare yourself for high school golf. It is an exciting sport to learn and even more exciting to be a part of a team. First of all getting started through the first tee program is a must. This is offered through Red Hawk golf course and each summer lessons are offered for all age groups. Red Hawk is an outstanding facility that will give your daughters a head start on their high school golf careers. They will teach your daughters the basics of golf along with etiquette and a chance to play all summer. The cost is minimal and very worth your daughter’s time. Just pick up the phone and give them a call at 563-386-0348. Tell them you are interested in the first tee program and they will give you all the information you need. The sooner you start golf the better. These are all opportunities for your daughters to prepare for high school golf. We would love to see them grow and come through the Red Hawk program first. Once in high school they will receive free lessons during season, free golf balls, free playing privileges, and a team golf bag. You really cannot beat the price. Thank you for taking the time to check out our web page and please don’t hesitate to call with any questions about how to get your daughters started in what is a wonderful life time sport. The Wildcat Golf Club program is structured utilizing the First Tee Program. The Wildcat Club will meet once every week or two in the Summer to play golf. The first meeting is Tuesday, June 7th, 1:00pm at Red Hawk Golf Course.